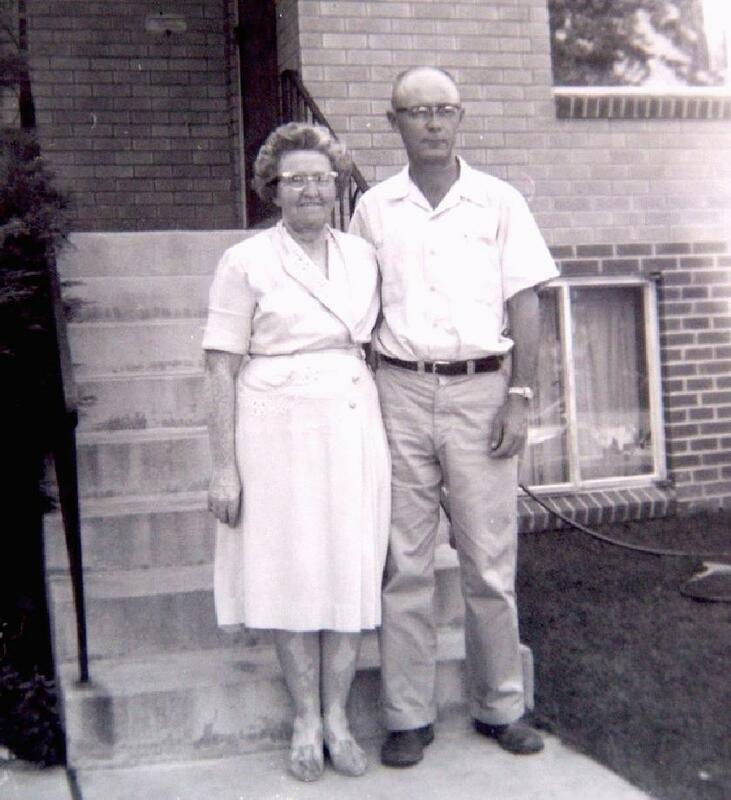 He married Birdean Leggett, Jun 5 1929, Wellington, Sumner County, Kansas.4,12 Birdean, daughter of Fred Leggett & Rachel Anna Money2,8,10,12,13,14, was born Jan 29 19082,8,10,12,13,14, near Clearwater, Sedgwick County, Kansas2,8,10,12,13,14 [Wellington, Sumner County, Kansas4]. Hinshaw, Leslie D., lodger, age 21, born in Kansas; father born in Indiana; mother born in Illinois; first married at age 20; occupation: teacher, public school; not a veteran. Hinshaw, Birdean, lodger, age 22, born in Kansas; parents born in Missouri; first married at age 21; occupation: teacher, public school. Hinshaw, Leslie D., head-of-household, age 31, born in Kansas; completed 1 year of high school; on Apr 1 1935 was living in Wichita, Kansas; owned home ($1500 value); occupation: clerk office, coffee wholesale; worked 52 weeks in 1939; $1352 wages in 1939. 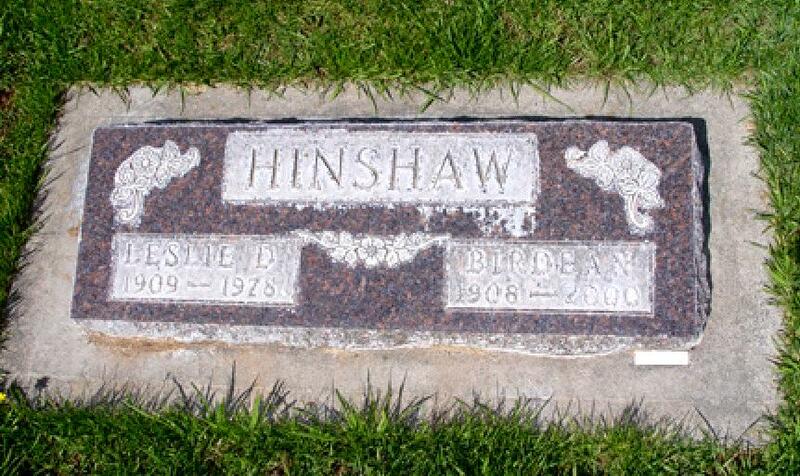 Hinshaw, Birdean, wife, age 32, born in Kansas; completed 4 years of high school; on Apr 1 1935 was living in Wichita, Kansas. Hinshaw, Arlene M., daughter, age 4, born in Kansas. Leslie Delbert Hinshaw died Oct 14 19788,11,17, Grand Junction, Mesa County, Colorado8,11,17 [Meeker, Rio Blanco County, Colorado4]; buried Row L Lot 2, Highland Cemetery, Meeker, Rio Blanco County, Colorado8,11,17. "Notable Southern Families", Volume III; Zella Armstrong; Clearfield Company, 1926; http://www.ancestry.com. 1910 census, Anson Village, Sumner Township, Sumner County, Kansas; roll T624-458, ED 170, page 244A, line #18, dwelling #68, family #70. 1930 census, Salem Township, Sedgwick County, Kansas; roll T626-719, ED 31, page 7A, line #15, dwelling #162, family #163. 1910 census, Ohio Township, Sedgwick County, Kansas; roll T624-455, ED 91, page 2B, line #61, dwelling #37, family #37. 1920 census, Jarvis Township, Grant County, Oklahoma; roll T625-1460, ED 94, page 5A, line #38, dwelling #103, family #103.